Shooting Challenge: 24 Retro Shots That Took Us Back... Vote For Your Favourite! It's Gizmodo Australia Shooting Challenge prize time! There are some amazing photos in this bunch of entries, now we need you to vote on who wins the Samsung Galaxy Camera! Note: In the interests of fairness, voting has been restricted to one per user, based on cookie and IP. Styled to look like the old Olympus Pen F from the 1960's, the brand-new Olympus PEN E-P5 is a retro masterpiece. Packing the same 16-megapixel Micro Four-Thirds sensor from the beloved Olympus OM-D, the E-P5 is really something to behold. 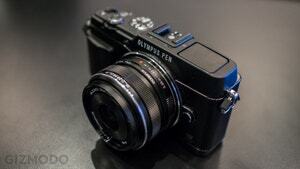 The new Olympus Pen E-P5 is slimmer and smaller than the OM-D, but retains much of bigger camera’s fantastic functionality. The new, top-of-the-range E-P5 is also packing a high-resolution, 3-inch tiltable touchscreen on the rear with 1.03 million dots so that your image preview looks as gorgeous as the subject matter. Focus peaking on the E-P5 also makes an appearance, showing you exactly where the optimal focal point for your image is before you snap it. It can manage all this thanks to a souped-up new processor inside the camera that makes everything much snappier. The E-P5 also packs better Wi-Fi connectivity than ever, with an app now allowing you to view, sync and shoot images remotely from a tablet or smartphone, effectively setting your photos free. The new Olympus E-P5 is the perfect addition to your digital life, and we're excited to give two away over four weeks to Gizmodo Shooting Challenge faithful. You'll be playing for an Olympus E-P5 single lens kit, which includes the Olympus PEN EP-5 body in silver, with an Olympus M.Zuiko 14-42mm II wide-angle zoom lens. The prize pack is valued at $1199, and we can't wait to give them away! We had an amazing number of entries into this week's competition and the race is going to be a close one. Check out the images and vote on your favourite! Spent all weekend racking my brain for something, only to come home and notice this little guy on my desk, a gift from a friend's recent trip to India. Desaturated the background a bit hoping I could make "messy desk" stand in for "busy Mumbai St". I took this shot on Sunday of my sons footy team playing in brilliant sunshine but on a ground that was appallingly muddy. It's slightly blurry, slight overexposed, and has a footy field so soaked you can see a seagull has stopped to watch the game as well. I rounded the corners and It reminded me of photos my parents took of my brother in the 1970's. You just don't see these conditions anymore on the footy on TV, you have to go local to go retro. These are a couple of my old loved cameras that fit the retro theme to a T. The spectra hasn't been used in a long while, the Canon FT is still excellent, solid, heavy body, though because it takes film it doesn't get used as much as it should, impatient for results! The photo was taken down my local, I needed a setting that matched the charm of the cameras. I used my Panasonic DMC-FZ200 with tripod and macro mode to shoot. 500 ISO, F2.8, 1 sec exposure. Duet. The old and the new. I love the concentration on 6-month-old Lucinda's face as she adds interesting harmonies to Dad's 12-bar-blues. This moment is best seen and not heard :P Taken on Nikon D40, edited in Lightroom. ISO 800, 55mm, f/5.6, 1/10 sec. In the middle of vacation and remembered the retro photo contest so I snapped a picture of this war era truck after several strong drinks. Growing up I spent a lot of time in and around the water, and this shot of an old rope swing dangling over the river brings all those memories of summer by the water with family and friends back into my mind. Taken on my Pentax K-30 on Saturday with the iso at 100 and f/5.6 at a modest 1/100th of a second. This is our old Stacked Hi Fi setup. Bought in the early to mid 80's. we later added a CD Deck [Yamaha]. I only ever use it to play vinyl. When lit up and in a dark room it looks pretty cool especially he graphic equalizer. Too the shot on my iphone 5, with the default camera app, with the grid and HDR options enabled but no flash. Used a LED light behind to give some extra light. then cropped and edited in Camera+ used the Lo-Fi filter a bit to darken it. It's a bit cramped in there so it was hard to get a better shot. Please note that AKAI and TEAC at the time were name brand Japanese manufacturers, and not the re-badged crap they are today. I believe you can still find some of their products overseas. I have some of these old coke glass bottles and old fan at home that I thought would be retro enough. Whats more this is shot using an Asahi SMC Takumar 50mm f/1.4 lens circa 1972. A last minute scramble to submit something had me reaching for the most retro bit of camera kit and the least retro member of my family. This is Pepper, and she made me show her how the camera worked. After clicking away for 5 minutes she said: Can I look at the pictures? It was hard for her to grasp that there was no screen to see what she'd just photographed, let alone the concept of film and delayed gratification. Whilst I was at it thought I'd throw in a nod to the next generation: camera implant anyone? These are 300B triode valves, first manufactured in 1938 and often used in high end audio amplifiers. I had to be very careful shooting these, as they are quite expensive and they balance precariously on their ends. One wrong move and they could have all ended up in pieces. Nothing beats retro more than playing your old consoles, and if it's going on display, nothing beats Legend of Zelda: Ocarina of Time. Unless it's the mega drive, with Sonic the Hedgehog. Or even the Ol' Atari 2600 with 32 games in 1! Which, quite literally, was the only game I ever had on that as a kid. This is a shot that I took of my son over the weekend. He's just turned 4 months old and I really wanted to capture some great images of him. I was lucky enough to have a friend who lend me his D800 to use. It was a RAW shot that I've edited in Aperture to give a retro feel. I totally forgot about the shooting challenge this week, so I grabbed my camera and went hunting for something retro. There's nothing retro in my house, so I drove over to my gf's house who's parents have mounds of cool retro stuff everywhere, including this fully working vintage phone (which I think has a face) and took a few snaps with my Canon 500D. Basically wanted to focus on the dial wheel, so I set my 50mm lens to f1.8 at 1/60 at ISO400. Then I did a few layers of filtering in Lightroom 4 to give it that retro sort of look. Taken with a Nikon D3100 With kit lenses 18-55. Read the brief about the Atari 1600 and decided to do something similar with a different console. Always played on one of these whenever I had the opportunity and still play the games regularly now. It's the final hour of the final day of this round of entry. I want the damn camera that Gizmodo is offering. I want it bad. I need something to submit, and my wife says "Noooo don't take a photo of meeeee..." so what can I do? I have nothing retro on hand besides these glasses and my bedsheet, so I did a double exposure combining an emo self portrait with the texture of my bedsheet. I think the look is retro but seriously, what the hell is retro? Anyways, clock is ticking. My camera is a faithful Canon 5d2, rocking Sigma's 35mm f1.4 DG HSM and a 580ex flash. For this challenge, I didn't have to look to far. I captured my sons empty sandpit and abandoned play items in the rear yard. I believe that it captures the idea that children once played for hours outside, rather then the digitalised entertainment now found indoors. Shot hand held at this low angle and processed in Lightroom 4. Gave it a desaturation, added grain, a little split toning and a light leak feature. I haven't attempted this style before, so thank you for what I learnt in shooting and processing. Sony A65, SAL1650, 16mm, ISO200, f4, 1/100sec. I wanted to shot something cinematic with my beloved Sankor 16C 2x anamorphic projector lens. I got an idea from the "Run Run" LG TV ad with the samurai riding a horse on the beach. I wanted to stage two street samurais (hoodies with katanas) fighting on the beach, but with the weather bad there was no chance i was going to convince my friends. So I went out to Lake Eppalock in the bad weather with a Frankenstein lens combo in hand to plan and frame the unlikely shoot. Well while I was there I like the shape of a tree by the waters edge and remembering your retro comp I went screw it putting a TLR in the tree and snapped this shot. To create this shot I attached a old 16mm 2x anamorphic projector lens to the front of a USSR zeiss clone using a specific clamping solution from Vid-Atlantic. This setup requires both the attached and taking lenses to be focused together, which is lots of trail and error. In post I vertically squeeze by 50% to correct the aspect. Because shooting this style creates a unique soften image I followed a youtube tutorial to apply a grunge look to bring back detail. I love the end result of anamorphic but the time and effort means I never actually do it. Retro Games! My favourite sort! Can't beat that old school feel when you boot up an old cartridge and see the games flicker on screen. These electronics were made to last. The TV in this shot was my parents' old 12" triniton, I think it's as old as I am. It still works well! Also my very own Super Nintendo is still chugging along (I got on it my seventh birthday). Canon 5D, 50mm @ f8.0, ISO 100 3 Flashes, one soft boxed, one gelled and one bare bulb. My prized MJ cassestte that I bought when I was 13. Its the 'greatest hits' and you can play this all day without forwarding a track. Best part is it still works like a charm. Any MJ fans out there? Vote for me! With the retro theme, I thought of walkman first but the cassette has a bit of personal touch. I gave the photo a vintage look in PS Express. My name is slightly visible on the cassette. I used to lend them to friends and ensure I got it back. But now I wouldn't :) Shot on Canon 500D, manual mode, ISO 400, 18-55mm kit lens, I wanted to give a soft blur to everything else and highlight the cassette. My dad's first camera was an Olympus and he always raves about it. Also, his photos can prove it too. I would love to have the PEN E P5 as my walk around camera as my DSLR can get a little tiring. I believe this is a great camera and love the retro look with all the innovative features. Another big(!) plus, I love all the stylish leather accessories that I can get for this camera. Want one, yes please! Have a nice weekend guys! Canon 5D mk3 with canon 100mm f/2.8L Macro. Photo of an old Polaroid 640 I brought when I was in america late last year, I found it in a charity store (called Goodwill) and wondered what it had seen in its life since it was made? How many hands has it passed through before it came to mine? I like this photo because of its simplicity, relating to how simple the cameras used to be compared to what they are now. This is a kind of double retro, not only are the scales retro the photo was taken on film (that's why there is no Exif data). This was taken at the Queen Victoria Markets in Melbourne, very early saturday morning at my favourite vegetable stall. The camera was my Canon VT rangefinder, with an early serenna 50mm 1.8. The film was Illford XP2, set to 400ASA, exposure was 60th of a sec at f2.0. The Canon VT is an unusual camera, it has a trigger film advance built into the base for taking rapid shots.